The manufacturing industry involves many types of operations, including the management and storage of products that need special handling to avoid damages and malfunctions that will negatively affect productivity and profit. As such, storage and shipping logistics personnel use material handling equipment to speed up and safely store, transport, and handle all goods, from raw materials to finished products. An article in Thomasnet details the various kinds of material handling equipment, which generally falls under four categories: storage, industrial trucks, bulk material handling, and engineered systems. Storage equipment is used in handling goods that are not in use or in transit, or need to be stockpiled. These storage devices include pallets, cabinets, drawers, and racks. Industrial trucks are machines used to transport goods from one phase to the next (either handling or shipping). 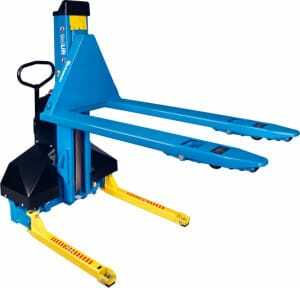 Sturdy industrial equipment, like a pallet truck,, is operated either manually or through a power source to safely load and transport goods from one manufacturing area to another, or to a cargo vehicle. Bulk material handling equipment is used for managing and moving bulk goods within a plant, warehouse, or similar facility. These include conveyor belts, stackers, bucket elevators, and silos. Products that are in the bulk handling material stations are generally incomplete and need to be processed to make up the final product. Finally, similar to bulk material handling equipment, engineered systems are used to transport goods within a facility. Unlike the latter, however, engineered systems are automated, and some, like the Automated Storage and Retrieval System, are designed to manage and facilitate storage to transport movements. For business owners whose operations involve storing, manufacturing, and transporting, choosing the correct material handling equipment is crucial. Storage and warehouse equipment companies, such as Carolina Material Handling, offer a wide array of industrial equipment, from heavy duty casters, pallet jacks, and hand trucks that are used for in-house storage and transportation, to sturdy dock-loading equipment, pallet racks, and wire decking. The equipment specialists at CMH can also assist customers with any questions regarding the equipment, including recommending the most appropriate products and solutions. In the world of manufacturing, goods come and go off the shelves in a matter of minutes, even seconds. Having the right equipment to handle various products is essential in ensuring efficiency and safety.